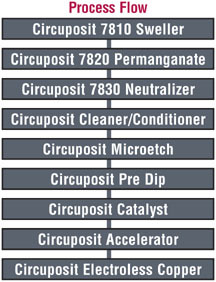 CIRCUPOSIT™ 7800 Series - Making Holes Conductive processes are a core competency of Dow Electronic Materials. Select from vertical or horizontal; low build or high build; direct plate or electroless copper processes to find the process that best meets your requirements. 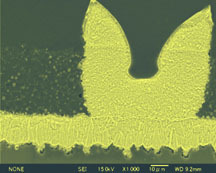 When chip packaging designs demand ultra fine conductors built by Semi-Additive technology, adhesion of the conductor to the substrate is an essential result of the metallization process. The CIRCUPOSIT 7800 adhesion promotion process delivers optimum surface roughness and subsequent metal adhesion on today's chip packaging substrate materials.